Sugo con Pancetta Pasta Sauce for sale. Buy online at Zingerman's Mail Order. Gourmet Gifts. Food Gifts. Made from tomatoes, onion, pancetta (Italy’s version of unsmoked bacon) this is a meal in a jar. The pancetta’s fat adds luxurious mouthfeel and lends the flavor a savory balance to the sweetness of the vegetables. Toss with just-cooked pasta and serve. 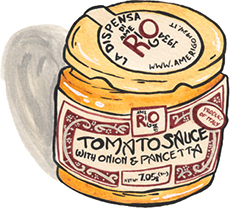 You can spend a weekend making your own sugo con pancetta or save yourself some time and buy a few jars of this. It’ll turn your routine pasta night into something to celebrate.